Sorcerer's headpiece for cosplay, role play, theater. Oberon, lord of faeries, comes to life in this intricate, exquisite crown. Designed for a man, this head wear would be just as well suited to a strong, powerful woman who knows exactly what she wants. Lightweight papier maché horns, wrapped with pieces of leather, shiny fabrics, embellished with thorny shells curve up from the back of the head, rising defiantly before angling back again. Swoopy, swishy, playful raven black coque feathers, some delicately touched with gold, swirl across the headpiece, creating movement, in a graceful curve. A length of gorgeous black rooster feathers, shimmering in dark green, flourish in bold, baroque assymetry. Stunning purple and violet faux gems, set silver-black metal make a strong statement on the headband, hand stitched for added stability, while above them, a delicate moon, hand crafted of cold porcelain, rises amid fabric ivy leaves. Gorgeous late autumn leaves, some real, some fabric, wind and twist, weaving a magic spell: fascinating, colorful, hypnotizing... pinecones and thistles cap the horn bottoms, because every beauty has got to be a little spiky. Be as big as your love, and as powerful as you dare in this one of a kind piece personal regalia, the kind of adornment to grow with, relishing your self-worth, to share treasures of your heart. Transform in to a magical creature unbroken, strong, fearless in this fabulous, shamanic fantasy. 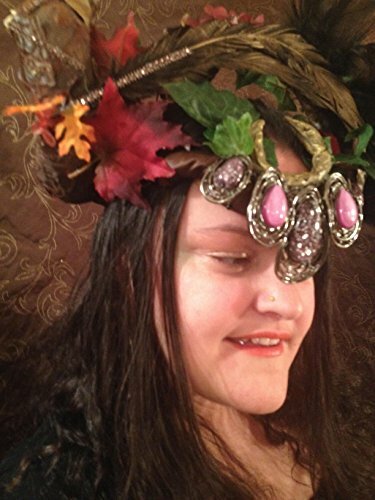 A May Day Beltane headdress, a Fairy God or Goddess, Queen or King's crown, for a handfast, a play, a maypole dance, for special occasions for many years to come, a piece to help you forge unforgettable memories. This headpiece is super comfy but it is somewhat heavier than much of my work. You will stand with dignity in this, and leave the wild abandonment of the dance to the others when wearing this. You can bend the frame to fit your own head perfectly, though it will be most sturdy on a medium to large head. If you have any questions about this product by crooked crow masks, contact us by completing and submitting the form below. If you are looking for a specif part number, please include it with your message.